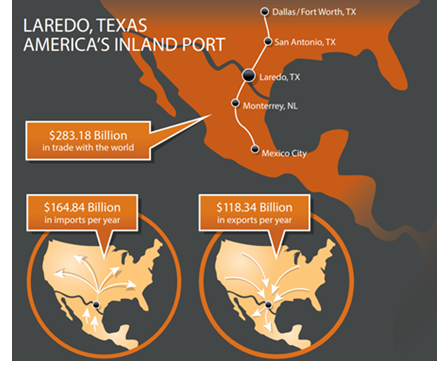 ​​​ LAREDO – Majestic Realty Co. is moving ahead with plans to develop its next warehouse building at Port Grande. ​The company will break ground mid-2018 on Building #2. The 423,280-sf facility will feature 32-foot ceiling clearance, 120 dock-high doors, four ground level doors, a secured truck courtyard, 242 trailer parking spaces and 208 automobile parking spaces. Located just east of I-35, Port Grande is ten miles from commercial border crossings and has immediate access to Union Pacific Intermodal. Building #2 is part of the company’s 100-acre Phase I of the Port Grande development, which also includes a 366,080​​​​-sf Building #1.